Named after the gun manufacturer Roy Weatherby, the Weatherby Hunting and Conservation Award was established in 1956 and is presented annually to an individual hunter for his or her hunting accomplishments, character and sportsmanship, and contribution to conservation and education. The selection committee defines an award winner as a "hunter who has ethically taken the most varied, difficult, and largest number of species in the world, and who has not already won the award." In Hillerman's People of Darkness, the character of B.J. Vines has won the Weatherby Trophy twice. It is unclear whether this discrepancy has to do with Hillerman not confirming the rules of the award, or if the rules have changed over the years. B.J. Vines supposedly won the award in 1962 and 1971. The actual winners for those years were Prince Abdorreza Pahlavi (Iran), and Juan Naude Cordova (Mexico) respectively. 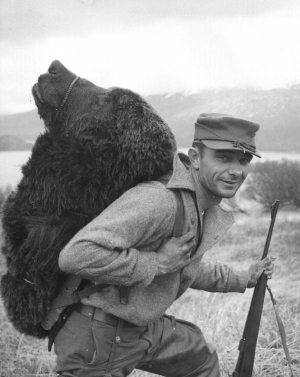 "Hunting trophy in the form of a bear's head, Kodiak National Wildlife Refuge, Alaska, May 11, 1957" by William A. Troyer is licensed under Public Domain. N.d. Winning the Weatherby Award. https://www.weatherbyfoundation.com/about-us/, accessed January 26, 2018.